I’m back with another tickle your taste buds elixir. This one is extra frothy and delicious thanks to the cashews. 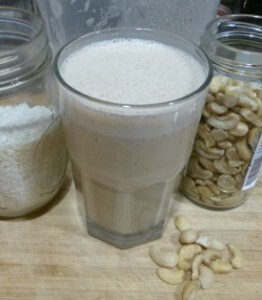 Cashews are a great smoothie and elixir ingredient that I often forget about. While soaking the cashews I picked up from my local co-op I remembered how well they blend in elixirs. They lend to that signature elixir frothiness while providing a good source of calories. If you’re consuming an elixir for breakfast it’s important to get enough calories to sustain yourself until lunch. Rich in a number of vitamins and minerals and healthy fats, cashews are one of the healthier nuts you can consume. The monounsaturated fats present in cashews along with magnesium and antioxidants promote good cardiovascular health. Cashews are also known to promote healthy skin and hair, strong bones, aid in weight loss, and help prevent gallstones and cancer. This recipe may seem high in calories and fat, don’t fret, it’s the good kind from cashews and coconut oil. That many calories from candy bars would be an issue. These good fats keep you satiated and full of energy until your next meal. As a matter of fact the medium chain fats in coconut oil are almost exclusively burned for energy. Choose your favorite herbal tea for this recipe or check out my article, wonderful health benefits of tea, for a list of my favorite herbal teas and more information on using tea to improve your health or address a health concern. Enjoy! Place all of the ingredients into your blender followed by the tea and blend for around 30-45 seconds or until nice and frothy. I’d love to know if you try this creamy coconut cashew elixir – please leave a comment below. Happy Blending!